Getting the hang of it. The ThinkPad Yoga 370 is Lenovo’s first 13.3-inch laptop in its ThinkPad Yoga series and is an attempt to simplify the line-up. Our extensive review shows how Lenovo succeeded and why we liked the ThinkPad Yoga 370. The Lenovo ThinkPad Yoga 370 isn’t the flashiest Yoga, but offers a lot to productivity users who need a powerful two-in-one for writing, drawing or scribbling notes. The ThinkPad Yoga 370 combines the conveniences of a 2-in-1 convertible laptop with Lenovo's reputation for durability and IT acceptance, but battery life and overall performance are merely average. And if you really want to save money over the X1, there's the 13.3-inch Yoga 720 for $760 with the same CPU, memory, and storage specs as our 370. Of course it's not directly comparable—it has no stylus, and in our review we complained about its inferior arrangement of the keyboard arrow keys. But if you seek a laptop-first, tablet-second convertible and don't need to draw or write in longhand, it's a solid value. Like I said in the beginning of this review, if you think that Lenovo's ThinkPad X1 Yoga looks great but is a bit too big for you, look no further than the ThinkPad Yoga 370. It has the same premium carbon fiber design, soft and comfortable keyboard, and of course, 360-degree hinge. It also includes retractable keys for when you're using it as a tablet, and a pen that can be stored in the device. If you are shopping for a durable business notebook that can double as a tablet when the need arises, the ThinkPad Yoga 370 is a fine choice. Apps and programs load quickly and you can stuff it with even more storage and power. Also, you get a decent pen experience and a keyboard that offers plenty of tactile feedback and disappears when you’d rather have a tablet than a notebook PC. No, it’s not the most exciting looking PC ever, but durability is more important. 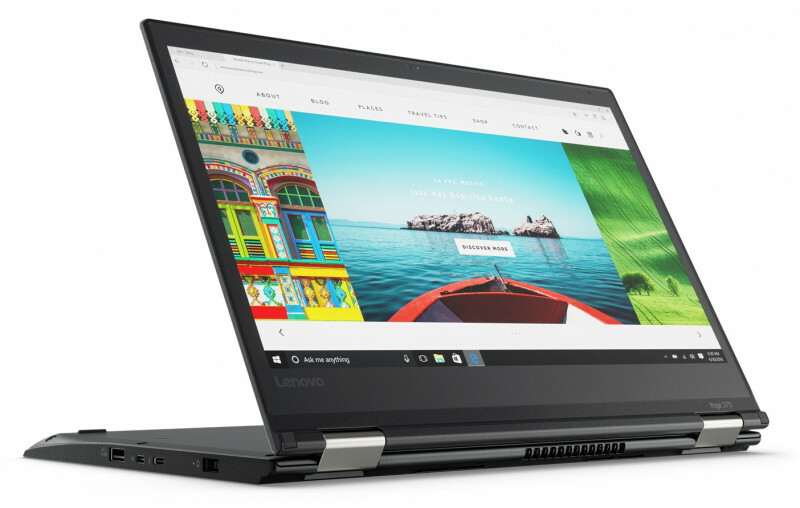 The Lenovo ThinkPad Yoga 370 is a well rounded convertible. It’s not the thinnest or the most powerful laptop on the market, but the Intel Core i5-7200U still offers solid performance that will likely meet most user’s needs. The glossy panel is more reflective than the matte screen often seen in most ThinkPads, but it’s also far more enjoyable to look at. The laptop feels great to use with a best in class keyboard and an excellent stylus. Finally, the larger battery offers a much-needed boost to battery life. From its accurate stylus to its bright screen and tactile keyboard, the ThinkPad Yoga 370 has a lot to offer productivity users who need a powerful 2-in-1 for drawing or scribbling notes. However, this pricey 2-in-1 also has short battery life and small annoyances, like a slow SSD, limited viewing angles and a touchpad that doesn't catch every pinch-to-zoom. Model: The Lenovo ThinkPad Yoga 370-20JJS00100 offers a lot to productivity users who need a powerful two-in-one for writing, drawing or scribbling notes. Its 360-degree hinge lets its screen flip over so it can be used as a tablet, and it has a stylus with a built-in holder so a user can easily jot down notes. In addition to Laptop mode, there are Stand mode (which has the screen facing user, and the keyboard facing the table), Tablet mode (in which user fold the keyboard a full 360 degrees away, with the screen facing user), and Tent mode (which has the hinge pointing upward, and the screen angled toward user). Lenovo uses a mix of materials for the case. The bottom shell and the lid are made of carbon while the palm rest is made of aluminum. Given its convertible nature, the display is covered by glass. The base and palm rest have a slight rubbery feel to them, the display is more velvety and slick, and in its entirety, the feel of the device is very high-quality. The case’s stability benefits from its high-tech materials as well. The Yoga 370 passes military-grade requirements, including durability tests like dust/water intrusion, vibration, and shock. It will shrug off the occasional spill directly on the keyboard, and survive most commuter and office environments. The extremely responsive and tactile keyboard is one of the laptop's best features; typing on it feels like collapsing onto a comfortable mattress at the end of a long day. The way the smooth keys bow out slightly along the bottom edges is a unique Lenovo design innovation. It feels satisfying when writing long pieces and the wrist rest is comfortable. The speakers are hidden under the keyboard, and they produce clear sound for listening to music, watching movies, and video conferencing. They are loud enough to fill a small-to-medium-sized room. A fingerprint reader on the right of the palm rest works with Windows Hello, though the HP Elitebook x360 has both a fingerprint reader and an IR camera for hands-free login. One of the processors used most often in modern laptops is Intel’s Core i5-7200U, which Lenovo ThinkPad Yoga 370 is equipped with as well. This dual-core 15 W Intel U-series CPU was specifically designed with Ultrabooks in mind. As for storage, the laptop is equipped with a 512 GB Toshiba NVMe PCIe SSD. It has 8 GB of RAM and an Intel HD Graphics 620 graphic chip, which does not make it the most suitable laptop for gaming. The display of the laptop is a 13.3-inch 16:9 1,920 x 1,080 Full HD LED IPS panel. The screen is glossy and, so, considerably more reflective and prone to fingerprints. Despite the unavoidable glare in bright environments, images and HD video look crisp and clear and colors appear vibrant yet accurate. The battery has been enlarged compared to its predecessor; while the Yoga 260 featured a 44 Wh battery, the Yoga 370 comes with a much larger 51 Wh lithium-polymer battery instead. This means battery life has also improved significantly. 79.34%: This rating is not convincing. The laptop is evaluated below average, this is not really a recommendation for purchase.